Good morning! Today I welcome back Troy from The Financial Economist for a new installment of this investing series. Investing, what is the point? I’ve never talked much about buying individual stocks and individual stock picking, because I prefer to buy and trade index ETF’s (e.g. S&P500 ETF, NASDAQ ETF). Today I’m going talk about buying and selling individual stocks by introducing you to William O’Neill’s CANSLIM stock picking style. In the stock market, there are always leaders and laggards. Let’s assume that the S&P500 is experiencing a big bull market and over the past month has posted a 10% gain. However, that “10%” is just an average of all the stocks in the S&P500. The stocks that exceed the average (10%+ gains) are called leaders and the stocks whose returns are below average (>10%) are laggards. 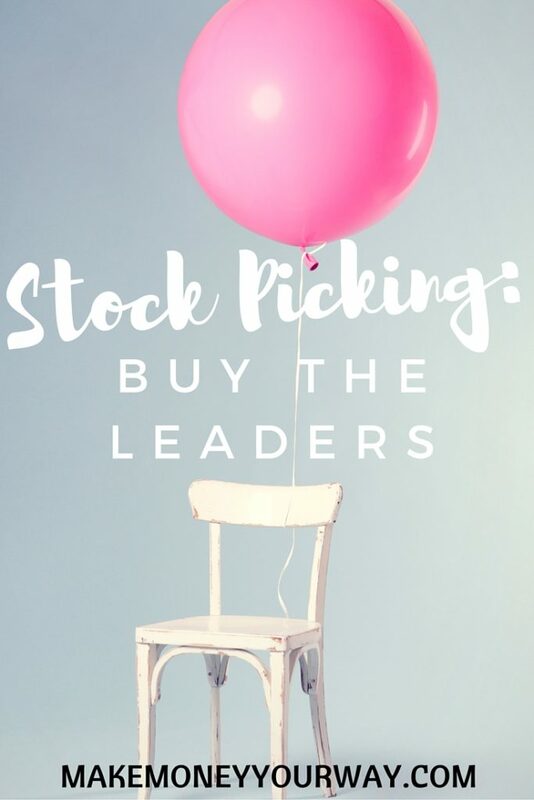 What the stock picker does is buy the stocks that are posting the biggest gains right now (leaders). He sells his stocks that are no longer posting the biggest gains and buys the new stocks that are posting the biggest gains. That way, he or she can always make the most money with the individual stocks that are performing the best. Here’s how stock picking using this strategy works. Once a week, you will need to look at a list of hundreds of stocks (that’s why a lot of investors use computers to do this part). You’ll need to simply scan the whole list and narrow things down to the 5 stocks that are performing the best. Then you buy those stocks. You hold those stocks until they cease to be leaders. Eventually, all leaders will turn into laggards. Once the stock that you bought is no longer a leader, you dump it and look for the stocks that are the new market leaders. Then simply repeat the entire process. Essentially, what you’re doing is buying a stock that’s rising the fastest and holding onto it until it starts to slow down. Then you dump it, grab onto the next stock that’s rising the fastest, and hold onto it until it too starts to slow down. Rinse and repeat. When is this Strategy Most Effective? Ok, I know that this post is starting to sound like a get-rich quick scheme, but it’s not. You have to understand when this stock picking strategy works best. This stock picking strategy does not work that well most of the time. This works best in a bubble, which is exactly the environment that Dan Zanger was in from 1998 to 1999 (remember the dot com bubble?). Why does it work so fabulously in this type of environment? Because in a bubble, there will always be certain stocks that are soaring! One company goes public, its stock price triples in 2 days, then it starts to fall. Another stock shoots up 190% in 2 weeks, and then it ceases to rise with the overall NASDAQ. This is the environment where stock picking is most effective. There are a ton of stocks who are posting fabulous gains, and all you have to do is buy them. When Internet Company X ceases to be the market leader, all Dan Zanger had to do was buy into the next hottest IPO (Netscape, anyone?). He grabs the market leaders, and when those leaders cease to lead, he tosses them aside and grabs the new leaders. That’s how Dan Zanger pyramided $10k into $18 million. Of course, this isn’t as effective today because we don’t have a stock market bubble right now. That’s also why Dan Zanger is no longer trading – he’s now making the most of his money by telling other people how to make money in the stock market. If his stock picking strategy still worked that well in today’s environment, he wouldn’t be teaching seminars for $30k a pop. He’d long have been a bajillionaire. Just imagine, $10k into $18 million in one year. In two years, he’d be richer than Warren Buffett! He’d be God! What is your strategy when it comes to stock picking? This post was featured on the Carnival of Retirement, Carnival of Passive Investing, thank you! I actually go with what I know and use. I don’t know if that is called anything but I only invest in stocks that I know about and use and like. Not that I think they will make me rich but if I believe in what a company is offering I buy the stock. 10k to 18million sure sounds good to me! Dan says instead of chasing the stocks he can now teach you and sure you may learn what he did but doesn’t mean it works now. My strategy is this: I don’t currently stock-pick. I would like to invest in individual stocks more, but at this time I’m more focused on increasing my income so that I can put more in my 401k and pay off student loans. I imagine one day I might give stock picking a try, but for now I just can’t justify the time commitment it would take. I still enjoy your articles on investing, though, because I think they will be applicable down the road. Holly@ClubThrifty recently posted…Is Making Money Blogging Wrong? In my trading account I look at fundamentals to determine what stocks I want to invest in. I also have a few that are items that we know and use on a regular basis and have been around for years. Beyond that, I would say for most people that aren’t comfortable in the market that they should generally stay away from solely picking stocks as I’ve seen too many people get themselves into trouble otherwise. John S @ Frugal Rules recently posted…How Many Miles of Toilet Paper Do You Use Every Year? I buy boring old tried and true Canadian dividend paying stocks and plan to hold them for a long time. Vanguard ETFs are new to Canada so I am now concentrating on buying one of their ETFs inside my RRSP (registered retirement savings plan). I have selected a high dividend paying Canadian based ETF. I plan on putting all of my investment money in to that for the next few months then I will see about branching out. I don’t believe that you should have all your eggs in one basket so I will need to start holding GICs (like your CDs) in my RRSP because the government guarantees that you cannot lose your money in them (Canadian Deposit Insurance Corporation). I used to trade individual stocks and followed Bill O’Neill’s advice back in the late 90s. I had a couple years of 100% stock gains. Boy was I smart. Then the bubble burst and I was wiped out. My portfolio went from $860k down to $140k. I decided there had to be something better, and there was. I learned from Vanguard founder John Bogle to be happy with market returns and that costs matter. I now invest exclusively in low-cost passive index funds with the correct asset allocation for my age and need to take risk. And to stay the course. I have been very happy with that approach for the past 10 years. Not to be a nay-sayer, but isn’t this strategy a follow-the-leader type scenerio? You’ll just end up buying a stock when it’s hot (buying high) and then selling it later when it’s low – the opposite of what you’re supposed to do. I prefer to look at the dividend yield among the Dow for potential winners. A company with a strong balance sheet will not give away its earnings without having a basis for it. So if the dividend payment is strong but the stock price is low because of market conditions, then that will result in a high dividend yield and a potentially good purchase. This is a very interesting strategy. It seems like you’d need to have a pretty large portfolio in order to realize enough gains to offset the costs of trading that often. If you’re going to be buying and selling on a weekly basis, you better be making enough money to pay for the trades. Personally, I’m a long-term investor, so I just try to pick the stocks that I know will succeed over the next 10, 20, or 30 years. I have a few individual stocks, but they are for very well established companies that will be around for many years to come. I think buying ETF’s is a much better way for me not to be so worried with the ups and downs of the market. Kim@Eyesonthedollar recently posted…Can You Be Happy If You Have Credit Card Debt? I don’t trust my judgment. My strategy is just to go with a large cap index fund. Michael | The Student Loan Sherpa recently posted…The Real Value of a College Degree: Is it Worth the Money? I don’t have any experience in stock investment. I am particular in farm and real estate investment. However as soon as my income grow, I have plan to invest in stock and I will adopt the above tips for stock picking.